Blake grew up just south of Las Cruces, New Mexico, where he spent his spare time in his World War Two surplus jeep, exploring the desert. When he could, he sat with the old timers and listened to their tales of Geronimo, Cochise, Pancho Villa, and Billy the Kid. His love and respect for the desert weaves through his stories. 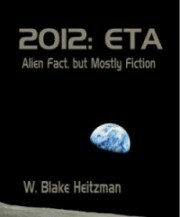 An avid reader, Heitzman is influenced by his favorite writers: Stephen King, H.G. Wells, Bradbury, Vonnegut, Michael Crichton and Tony Hillerman. A licensed Professional Engineer in the State of California with Masters Degrees in Energy Conversion and Urban Planning as well as experience as a college math instructor, Blake includes a dash of science and technology, along with a smattering of history and paranormal topics in his writing. He is currently writing The Shaman Gene series, the story of Earth’s rise to join galactic society. “A Far Traveler”, is the first in the series. Two more novels: Panther Watches and Seekers of the Scroll are in draft. Blake is also a member of California Writers Club and the Indie Author Network. The novelette, From the Agenda is included in 2012:ETA, but can also be acquired separately at no charge at Barnes and Nobles and Smashwords. Meditate on that and see how many meanings you can breathe into it. A Far Traveler considers, with liberal interpretation, these events in Moses’s life: The childhood in the court of Pharaoh, the burning bush, the competition of snakes with Pharaoh’s magicians, the parting of the sea, why Moses did not enter into the Promised Land. The story of Moses and the Exodus is considered by many religious people as metaphorical or logos for all of our journeys through life, or for particular segments thereof where we transition from slavery to freedom. Such slavery can be actual or psychological, mental, if you will. It doesn’t really matter, so long as we feel the imprisonment, and so long as we leave the benefits of our shackles and cross into the unknown, then the sea will part and we will achieve our new fullness of being. Benefits of our shackles, you ask. Yes often the security of our current condition and the fear of the unknown enslave us. Did the Exodus really happen? Before the Jews can leave Egypt, they have to have been there. Yes, we do know that Semites were in Egypt, in fact, they ruled Egypt for a time. We know them as Hyksos. The Hebrews could have been that group. There have been efforts to reconstruct the Hebrew escape, and one theory suggests that they could have crossed through a marsh land to distance themselves from the Pharaoh. Another suggestion is that at the eruption of Santorini, could have caused the plagues of Egypt, and opened the pathway for the Hebrew escape. Presentation of these ideas can probably be found at the History channel website, or maybe you can rent the DVD from Netflix. The ark held the tables written upon by the finger of God. That could be anything. A very interesting and academic investigation of the Exodus is Out of the Desert by William Stiebing. He assemblies evidence against the Exodus, citing among other items, archeological evidence that many of the cities referred in the Biblical story did not exist at a time when the Exodus could have happened. In other words, these cities developed much later in time. His final conclusion is every bit as beautiful as the Exodus story. He concludes that the Hebrews were slaves and lowly serfs who escaped from the coastal city kingdoms, into the hills where the rulers’ armies were unwilling to pursue them. There they joined together in a brotherhood of free people, much like the Cossacks of the Russian Steppe. Ah, when there was open land where free men and women could claim their own fate. If this view is true, then the exodus story is a metaphor for something just as beautiful. Finally, there are those who say that the Exodus story is both true and metaphorical, that a person or group may live a Divinely inspired life which also serves as a metaphor to those who would listen. I imagine all spiritual people can relate to this idea, but to the Kabbalahists it is absolutely so. In fact, I think the whole world and all of life is a giant never ending symbol from God to all those who dare open their senses to it. The Ark (at last) is a chest, overlaid and interlaid with gold, and other items of exact specification given by God. It’s purpose was to hold the two tables written upon by the finger of God, and brought down from the mountain by Moses. Although constructed by men, once finished, the chest acquired supernatural powers, such as it could hover itself, disintegrate anyone who touched it, even kill anyone who looked upon it. It was taken through the desert into the Promised Land where eventually it was given a resting place in the First Temple, build by Solomon according to the Word of the Lord. This temple was sacked and destroy, and at some point the Ark vanished. As you have guessed, the Discovery/History channels have had one or more programs on the Ark. Many books have been written about it. Mostly they speculate on its current location and whether the Hebrews got aliens mixed up with God, and whether the Ark is just an alien device. One concept is that it was a giant capacitor, which of course it was, since it is two layers of conductor separated by a dialectic, but I have a hard time believing that the priests could build much of a charge by rubbing wool on its surface. Before they could build a substantial charge it would jump to ground, probably through their bodies, and extinguish itself. It sounds like there was more to it than static electricity. After all no one really knows what the tablet written on by the finger of God was; it could be any material, and it could have its own intelligence built into it. Some believe that the Ark was hidden in the tunnels below the temple, and that the Templars were organized to go to Jerusalem and recover it. Generally these people believe that it is now either buried in the sink hole on Oak Island, where it seems impossible to recover it, even if it hasn’t been destroyed by sea water, or it is buried below Rosslyn Chapel, where it may also have been destroyed by mold, water, corrosion over the years. In my opinion the best study regarding the Ark’s current location is The Sign and the Seal by Graham Hancock. As always in these studies a lot may be made from a very little, never is the truth ever firmly discovered, however Hancock presents a compilation of compelling facts in this book, and I believe it’s worth the read. As far as The Shaman Gene goes, the third book, Seekers of the Scroll, gets into the the Templars, Hughes de Payne, Richard the Lionheart, Kabbalahists, and just what the Templars did not find under the temple mount. It covers three generations, and I’m only two thirds through the first draft, and this website is distracting me.